Welcome, teachers who have jumped into the fray! If you're like me, you have spent most of this year staying up past midnight most nights trying to stay one or two days ahead of your students. I remember my first year of teaching as one of the most engaged times of my career. Though constantly sleep deprived, I always felt I was discovering amazing things. One week I was trolling the Los Angeles library education shelves for graphic novel versions of Shakespeare, the next I was applying for a grant to create a theater corner in my classroom. I was watching poetry slam videos, trying to figure out how to deal with the language of Huckleberry Finn, learning discussion methods, planning tennis practices, reading every novel in the curriculum, and occasionally stopping for a cookie. I look back on the year fondly, but at the same time, I don't think it needed to be quite THAT intense! That's why I've started this series. It's meant to give you something to help you out in class tomorrow, something to help in the coming weeks, and something to give you a little more time overall so you can eat actual meals sitting down! So you've got a class coming in tomorrow. 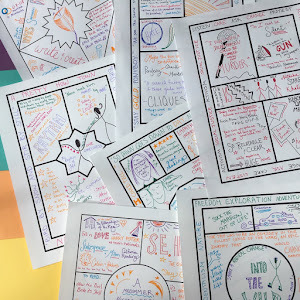 Whether they are writing journal entries, turning in a project, bringing a paper draft, discussing a reading... one of my favorite strategies for just about anything is one I invented called Rotating Circles. Have half the class stand up and create a circle. Then have half the class create a circle OUTSIDE the first circle. Have the circles face each other. Partners! These partners can share writing drafts, present their homework to each other, discuss a question about the reading, brainstorm a thesis, etc. Give them some time appropriate to the task and then have one of the circles rotate. Continue to do the same thing until you feel the activity is complete. These fast action rotations with multiple partners have really engaged my students. And I love how it works for just about everything! Literature Circles! I LOVED doing this with my American Literature students my first year of teaching. I presented two books to them, The Great Gatsby and The Sun Also Rises. Then I let them choose what they wanted to read. For the next month we met in our literature circles, each group discussing their own reading on their own schedule. I rotated from group to group, listening and helping as needed. Then they presented on their texts to each other. To help guide the students through the literature circles, I had them prepare for each discussion by completing a role assignment. For a great rundown on roles and the literature circle method in general, check out this free packet online. 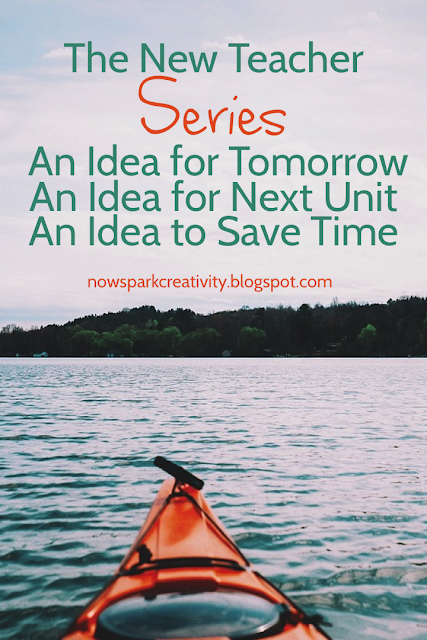 Idea #3, Saving time for things like eating! It's amazing how much CREATION has to happen in the first year of teaching. I find it very helpful to save my work as I go in editable templates. For example, instead of writing a vocabulary quiz for unit one, I can create a vocabulary quiz template with all the directions, grading components, answer blanks, etc. and save it. Then I can add in the words for unit one and save that separately. Here's an example you can download for free. Don't stop with vocabulary quizzes. When you design a rubric to grade a paper or project, think about how you can make it a rubric that would work for ANY similar paper or project. When you design an activity to warm up for discussion, think about how you could tweak the language so you could use it as a warm up again in a few months. Not everything has to be designed specifically for the pages you just read! One of my favorite packets I ever created for teachers has to be my 15 ELA Discussion Warm-Ups. One reviewer called it "Hands down, one of the BEST products on TPT!" And I think that's because these activities can be used for any book at any time. You might want this packet if you want to use this strategy immediately. You can also apply it to your own curriculum building all the time. Making activities that apply to more than just one moment of your teaching life will save you a lot of (metaphorical) sweat! If you decide to try these strategies, I'd love to hear from you! Join my Facebook group for Creative High School English teachers to share ideas and get support with other creative educators around the world. Thank you for these great ideas. I have been teaching for 19 years, but never tried literature circles. It always felt daunting. I like the idea of giving students a choice in books! I am going to try this after testing in April. Thank you for such a great idea! Wonderful! That makes me so happy! There was something really special about seeing students make their own choices about what to read, and take ownership over their own discussions and progress. I hope you will also find it a fulfilling and creative experience in your classroom.